To get an idea of what the Northern Michigan countryside might look like in the aftermath of a collision with some fiery comet, consider the logging-era photos of Lovells from the early 1900s. The surrounding land appears not just flattened but also scorched, bare save for a few leafless scrub trees. And in the epicenter stands Lovells itself. It’s a tin-roof gulag of gray-board buildings sinking in mud, overlooking timber piles, a smoky sawmill and some filthy slack water. The dark swill is unrecognizable as the same waters that trout fisherman now revere as the crystal North Branch of the Au Sable. With the forests all gone, Lovells might very well have ceased to be a town if it wasn’t for T.E. Douglas and the North Branch Outing Club. A Canadian turned Michigan lumber baron, Douglas stayed on to see the river and countryside gradually be reborn after the loggers moved away. 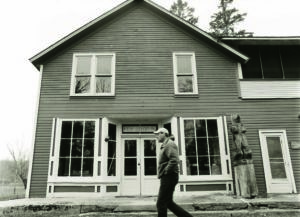 He predicted that the future for both himself and the North was in the outdoors, particularly fishing, and in 1916 he began inviting the most influential and affluent people of the day to fish and dine at a 20-room, lavishly decorated Northwoods retreat. Douglas entertained such automobile industry captains as Harvey Firestone, Horace Dodge, Charles Nash and, most notably, Henry Ford, who used to make regular pilgrimages from downstate in his very own railcar. For these men, the Au Sable River became a playground where fishing was the game. Many devoted anglers know that the Au Sable is the river where Trout Unlimited was born, inspiring a conservation ethic and, in a sense, the modern fly fisherman’s code. What people don’t know, according to Todd Fuller, co-owner of the newly opened North Branch Outing Club, is that according to Lovells lore, today’s American auto industry also began to take form right here. “It’s the old cliché: If these walls could talk,” Fuller says. He gazes from the second-story screened-in porch, down a sloping hill to the river, visible in dark sections between trunks of trees. What was lavish 100 years ago would be called rustic today, but the appeal is not lessened. 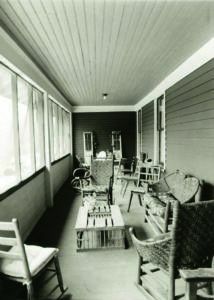 On the long wood-paneled porch wall behind Fuller, as throughout the rooms that make up the two-story inn, old fishing nets hang, as do wicker creels, wood cross-country skis with “bear-trap” bindings, and images of trout painted in various above-water contortions. Here, chairs sit close around a simple wood coffee table. It’s easy to imagine the banter of automotive VIP’s kicking back after a day casting for trout, bourbons on the table, smoldering cigars in hand, and dealmaking in the air. The Douglas Hotel, as it’s always been known around Lovells, is pretty much all that remains of the original town. The Douglas lumber mill, the blacksmith shop, Mrs. Simm’s boarding house—even the railroad tracks that brought visitors here—all are gone. 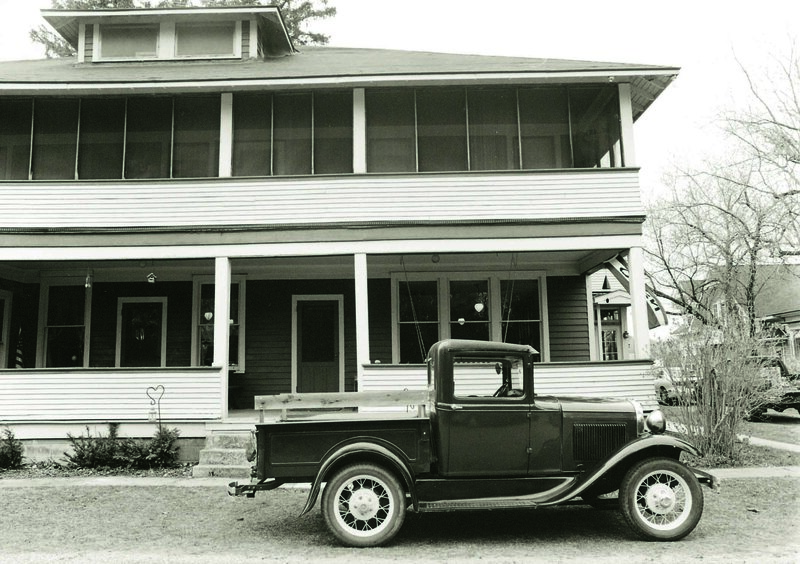 Four years ago, after promising to restore the hotel as a fishing lodge/bed and breakfast, the Fuller family (Mom and Dad cashed in their retirement to help secure the place) purchased the dilapidated riverside property from the 70-year-old grandson of T.E. Douglas. “After [T.E.] Douglas died, his daughter tried to make a go of the place for a little while,” Fuller says. By the time the Fullers happened upon the for-sale sign out front one sunny afternoon, the place had been on the market for two years, but it had been boarded up for almost half a century. The only tenants were bats. Fuller recalls the droppings ankle deep upstairs. “We scooped it up with shovels,” he says, “and found underneath all sorts of cool stuff.” A hunting license from 1916, a catgut leader, a spool of silk fly line, old newspapers. One special treasure now sits in a glass case outside the general store turned fly shop: a guest registry that shows the names of frequent visitors Henry and Edsel Ford. 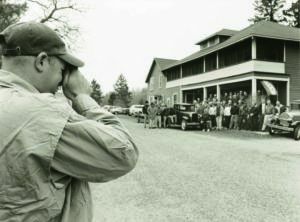 Upon re-opening its doors, the North Branch Outing Club was declared a state and national historic site, one of only 33 in Michigan (placing it in the same category as the Grand Hotel on Mackinac Island), and the state’s only public fishing lodge given such status. That feeling of tradition, the charm of all things old, is central to the North Branch Outing Club experience. “With the smell of fresh bread and cookies in the oven, more than a couple guests have compared it to spending a weekend at Grandma’s,” says Fuller. 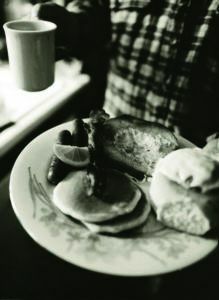 A new tradition at the hotel is a once-a-year open house on the first day of trout season, the last Saturday in April, when for a modest fee the Fullers cater breakfast for all comers in the hotel’s main dining room. 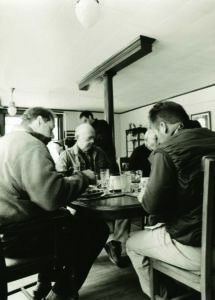 Jeans, flannel shirts and fly fishing vest adorned with feathered flies are the standard attire of the men around the tables, all poised over teetering stacks of plate-sized flapjacks, all bantering about trout with wide-eyed enthusiasm and all exhibiting much waving of hands. 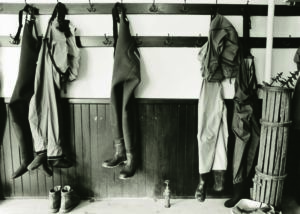 That’s one of the things about fly fishing and, in particular, this hotel: 100 years have passed and you know that even though the fishing is perhaps better than it’s ever been, the talk within these walls hasn’t much changed. Enthusiastic fish talk has always been the way among anglers, regardless of age or station. Henry Ford himself, gone these many years, could stroll into the room right now and have no trouble finding conversation and a chair. The recreation of days gone by isn’t restricted to the hotel’s interior. The North Branch Outing Club deploys a small armada of genuine Au Sable driftboats. “These boats are like time machines,” Fuller says. A design that traces back to the height of the timber boom, the long (up to 24 feet), shallow-bottom boats were invented for ferrying supplies and fishermen down the narrow, twisting rivers unique to the Northern Michigan landscape. 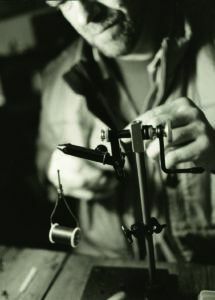 The trend among fishing guides nowadays is toward wider, high-sided McKenzie-style boats made of fiberglass and aluminum. But the heavy weight and long oars of the new boats make them impossible to maneuver here on the North Branch of the Au Sable. There are too many shallow runs, twists and tight turns. Au Sable driftboats, on the other hand, are poled by a guide in the stern. And in the hands of a skilled guide like Fuller, the Au Sable driftboat floats along lazily, with the stealth and agility of a quiet canoe. You see the driftboats in old photos back at the hotel. They hang above shelves laden with old books, and one is near a genuine crank-and-spin Victrola record player. After a breakfast of too many hash browns and eggs, the fishermen say their good-lucks and good-byes before heading out to the stream. Fuller stops in front of that black-and-white shot of Lovells after the loggers hit 100 years ago. A visiting angler gazing at the same picture gets a sense that the old days were not all good. But in life it’s always the best things that endure: the countryside, the trees, the trout that, for as long as they swim in the river, have drawn fishermen together with one hope. That’s the way it has always been and will always be. And that’s why at the North Branch Outing Club there’s a feeling of being at the heart of something … a feeling that good old days aren’t gone; they’re happening now. Fuller’s North Branch Outing Club is located at 6122 East County Road 612, Lovells, MI. Contact them at 989-348-7951 or visit the website at fullersnboc.com. For over 30 years the staff at Traverse Magazine has written about the history and natural world of our region. For the web series, Traverse Classics, we’ve reached into our archives to bring our favorites to our MyNorth.com audience. This article was featured in the March 2003 issue of Traverse, Northern Michigan’s Magazine.